Disclosure: I received a free review copy of this book to use in preparing for this post. At every client these days, mobility is a big deal, whether because increasing numbers of employees are demanding that the enterprise support their personal smart phones and tablets or because the organization is looking to gain competitive advantage through the strategic use of mobility in its core business processes. And although most of my clients have been enabling mobility since the advent of laptops, just about every one of those clients is in more or less uncharted territory when it comes to the new wave of mobility ushered in by smartphones and tablets. increasing numbers of employees are demanding that the enterprise support their personal smart phones and tablets or because the organization is looking to gain competitive advantage through the strategic use of mobility in its core business processes. This makes a certain amount of sense: after all, laptops are essentially portable desktop computers, while smartphones and tablets are radically new form factors that demand a reimagination of the entire end user experience. On top of which, these devices are often consumer devices, owned by employees, that therefore exist outside the reach of IT control. 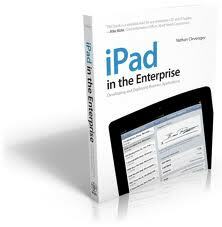 Given all the urgency and uncertainty around the enterprise use of mobile devices, iPad for the Enterprise is a welcome addition to the literature available on the topic. Nathan Clevenger has been involved in the development of mobile strategies and applications for over a decade, and the book reflects it. He begins with a consideration of iPad strategy that’s a wonderful primer for anyone involved in mobility at their organization, from developers in the trenches to executive leadership. It sets the stage through a consideration of how we reached the current state of mobility and introduces the concept of the consumerization of IT, i.e., IT changes being driven in a decentralized way by the “consumers” in the enterprise (the employees) rather than in a centralized way by IT. From there, it moves to more practical considerations and presents an overview of how to build an enterprise mobile strategy and application roadmap. Both are somewhat general—it’s difficult to generalize meaningfully about either of these activities—but nonetheless useful, especially for folks who’ve never participated in creating enterprise strategy before. With the groundwork in place, Clevenger moves through all the phases of iPad app development: architecture, design, development, and deployment. And while none of this is not intended as a detailed ho- to guide or instructional manual for app development, he manages to get in enough technical detail and code samples to make this a valuable first-stop for technical folks looking to better understand what’s happening under the hood of the iPad. All in all, the book is a strong offering. Non-technical readers will benefit greatly not only from the first section on strategy, but also from the more technical sections, which they can read selectively to gain a better preliminary understanding of concepts like sandbox security or iOS Human Interface Guidelines. Technical readers will not be disappointed in Clevenger’s treatment of app development and will also benefit from a better understanding of the context and strategy of iPad app development.